Want to ask Alexa for the readings of your personal weather station? Now you can! 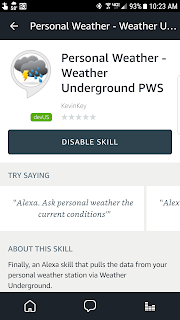 Finally, an Alexa skill that pulls the data from your personal weather station via Weather Underground. Reports current conditions including temperature, humidity, wind speed, wind direction, pressure, rain in the past hour, rain in the past day, and much more. You can ask for all conditions or just a specific condition. May 19, 2017: Added support for metric system. To use metric units, say SET UNITS METRIC. I've included a basic forecast (via Weather Underground data) as well. All you need is the Station ID and a free API key from Weather Underground. You can get your API key by going to www.wunderground/api and signing up. All you need is the Developer option. Please note that this skill is geared towards people that want to get current data from their person weather stations vs. those that want detailed forecasts. First, make note of your personal weather station ID. Most station IDs begin with the letter 'K' followed by a two-letter state abbreviation. Then there is a letter abbreviation for your town/city followed by some numbers. Sign in, if you haven't done so already. Select any of the "Developer" plans. There is no charge. Complete the process. Make note of your API key - it will be a series of numbers and lower-case letters. Have your API key and station ID noted down and readily available. Get Alexa's attention - say "Alexa" and wait for the confirmation tone and/or light. Wait for the app to say "Welcome to Personal Weather..."
After you hear "Please say a command" and then the tone, say "SET KEY" followed by your API key. It may take a few attempts to get Alexa to recognize your API key. You can try using the NATO phonetic alphabet* if Alexa keeps having trouble understanding you. Once the app successfully recognizes your API key, it will let you know. Now it's time to set the Station ID. Get Alexa's attention - say "Alexa" and wait for the confirmation tone and/or light. After you hear "Please say a command" and then the tone, say "SET STATION" followed by your station ID. It make take Alexa several attempts to recognize your Station ID. You can try using the NATO phonetic alphabet* if Alexa keeps having trouble understanding you. If the app finds a valid Station ID, it will tell you the location associated with the station. If the station is correct, say "yes" when asked whether you'd like the save the station ID. Once you have the API and station ID set up, you should not have to enter them ever again. You may have to use this technique to get Alexa to recognize the letters in your API key and station ID. If you don't know the words associated with the letters, you may wish to note down the phonetic spelling of your API key and station ID before repeating the above instructions. Once you have your API key and weather Station ID configured, here's how to use the app. "what is the dew point"
"what is the heat index"
Hi Kevin - I don't use the assistant devices but its good to see working on and sharing stuff for us! There seems to be a problem with the rain total and the rain in the past hour. Alexa reads out the wrong data not what is the actual data. Request: Would like to be able to set current conditions data. For example i would like to hear high wind in the current conditions. Great app! I found and (hopefully) fixed a bug with the rainfall amounts. Can you try again? I have tried 6 weather stations and Alexa says weather underground does NOT recognize any of them. Soon I'll be updating the app to allow a station to be specified based on location. This should make the process of specifying a station much easier. In the meantime, have you tried using the NATO phonetic alphabet to specify your station? If you still have trouble, tell me the last three characters in your API Key and your station ID - then I can manually enter your station into the database for you. She repeats back what I said so it's not that. Last three of API is 3e2 and the station ID is KSCCONWA28 or 40 or 21 or 20 or 34 or 30! Fjamer: Try now. Say "Alexa, ask personal weather the current conditions." You can also say "Alexa, ask personal weather the forecast." "Alexa, ask personal weather the temperature." etc. Hi, can you tell me where I can find this skill as i cant see it on my Echo account. Just search for PWS and you'll find it. Still not seeing it. I am in the UK. Is it only available in certain countries? Hi again. Send me a message at kevinkey@gmail.com with the email address associated with your Echo. I'll send you a beta invitation that will support UK English. Kevin, thanks for the WU Alexa Skill! Works great. Would it be possible in the future to have Alexa alarm for user selected events / storm warnings? Thanks. I'll look into a severe weather alarm feature sometime soon. Is it possible to add the skill to amazon.co.uk? I live in Portugal and have 2 weather station. Using alexa i'm unable to get any weather data here. Your skill will be a great thing to me. Thank you for this skill. You're welcome. And thanks for the donation. I can not get my key for work, Alexa hears the correct key but says I do not have a valid weather 7nderground api key. Any suggestions. I have set up a new key as Alexa would not hear 4 on first key. Is your key 8 characters? Or 16? Would it be possilbe for You to activate your skill for Germany? It does not matter that we have to speak in english to Your skill. That would be very very helpful! I have just activated your weather underground skill for my PWS in the UK. It's brilliant, very easy to enable once you have the API key. Thank you for your "skill" in producing this app. Thanks for taking the time and effort to create the Personal Weather Station Skill and making it available for other users! It works great. I'm new to the Alexa devices and all the smart home stuff, but if there is a way to use the IFTTT process and or setting alarms or notifications via the skill that would be really neat also. I cannot get echo to find key. When played back it is correct but echo keeps saying key not found. I have tried speaking and phonetic alphabet. Any suggestions? Thanks Kevin! I am having a strange problem on my Windows Visa. When I run the smartHUB Reader after a restart of the machine it runs for roughly 24 hours and stops. I have to restart Windows again and it will work for another 24 hours. Is there a debug log file that I can look in to to see what is going on? every hour. Would be nice to hear Alexa issue an alert that the temperature has reached 0 or windspeed has exceeded 20 MPH. Not sure if a skill can do this. Is there a way to ask what todays high wind gust was today ? Maybe even todays high temp ? Great skill. Easy to set up and use. Ich muss sagen, dass ich mir das amazon Echo Dot gekauft habe, teste dass seit 2 Wochen und bin sehr zufrieden, alles ist damit für mich noch einfacher. Great skill, just installed, setup was easy enough and Alexa and I are still on good speaking terms, LOL! Look forward to using this skill often! I can help you translating it! Please contact me with google hangouts. THX! Hi, any chance to get the skill in german language. My wheaterstation also sends data to whearterunderground, and i already get infos to alexa but only news that are defined. It would be great to use this skill with german language and ask different values. Helping in translations would not be a problem! Just installed your skill on Alexa. Great app with lots of potential for upgrade. As one person commented, would be nice to disable the weather reporting with my include wx station ID. Would also be nice to enable a shorter command than "Ask Personal Weather" all the time. But thanks for your work. Love the app. Kevin, I don't have anything to complain about or ask for. This is a tremendously helpful and easy to use skill. I just want to offer my sincere thanks for your efforts. I have activated the skill and tried to use your method to get the weather from my PWS. When I say 'Personal Weather' I get the default location forecast not 'Welcome to personal weather' and it never asks me for a command. This Skill looked promising, but I am stuck at trying to enter the API key. Repeated several times with same result. I don't know whether that is your Skill or Amazon's voice decoding, but frustrating just the same. The skill reports everything the same as the api - except the pressure. The pressure is always a few hundredths of a degree higher - e.g. the api shows the pressure as 30.27 and the skill reports the pressure as 30.31. I have it pointed to the PWS and it also returns everything accurately except the pressure. It is always higher. I thought with your experience with the skill, you might have some insight into the issue. Thanks. Kevin, are you able to make the Skill available from amazon.co.uk. I keep getting redirected there as my Echo is registered there, but it’s not visible or searchable. Would be great if you could do this! I'm trying to contact you with Google Hangouts ... is it possible we get a German version? As a UK Davis/WU user I would like to try your alexa skill BUT it is not available on the UK skill lists (for US only). Can you please change this change this ? Soon, I'll update the app to allow station identification based on location. This will make the process of station identification easier. In the meantime, have you tried using a NATO phonetic alphabet to identify your station? Is there a way that you can manually enter my weather underground api key and sta id key? 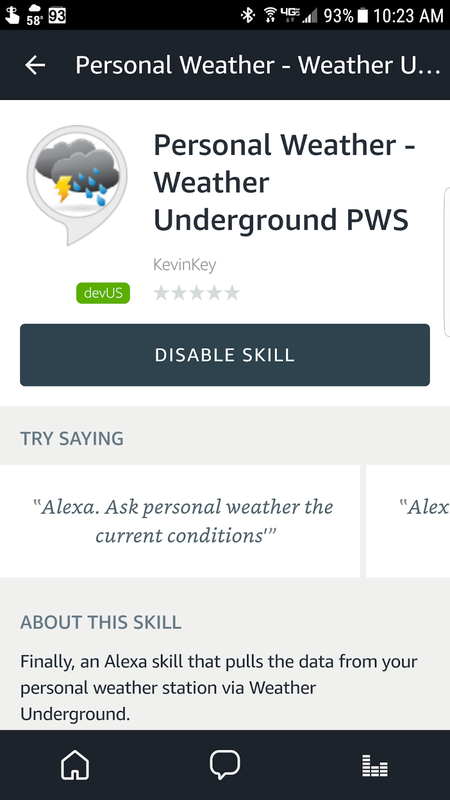 Alexa keeps responding that weather underground doesn't know my api key. My api key is 04e595f6, sta id key is KTNLENOI14. Thanks for your help. By the way, yours photographs are AWESOME! Has anyone encountered Alexa repeating the city of the selected PWS? For example, Alexa states the correct temperature or rainfall or whatever I ask and then ends the report with “Location, Philadelphia in Philadelphia.” That is, “CityName in CityName,” a repeat of the city. Any ideas? Great job! Works great! Thanks for the time you put into this! Nice job. Have you thought about creating a skill for Google Assistant? My alexa app would always identify the location of my PWS as being in Lee Boulevard Heights which is a suburb of Washington DC near Falls Church, VA, the same as listed in my Weather underground page. Within the last couple of days when I ask Alexa for current conditions it now identifies location as Washington. Why would this change have occurred? I did not change it and still as it was on WU. Any explanation would be welcome. Is it normal for the configuration to end up identifying your blog for additional help? I really don't know why Weather Underground has done this. And, if it's a glitch, why they haven't fixed it yet. I'm not 100% certain about the rest of you, but I'm still getting correct data from my own station on my own Alexa - despite it only announcing the city name of my station. The best I can do in the meantime is to have my Alexa skill speak your Station ID instead. Hopefully sometime in the next day or two. Sorry for the lack up responses and updates as I've been quite busy with other things lately. Unfortunately for now, we are removing the PWS name (from the API). This is in response to some new EU privacy rules which we are bound to follow to operate in Europe. While taking the time to address the EU issues we decided to beef up our privacy protections for everyone everywhere. We want to make sure we maintain the right balance of protecting our users, and disseminating useful information, We expect this balance will evolve over time as our community of PWS owners weigh in on our stance. In the meantime, I've modified my Alexa skill to report your Station ID instead. Fascinating, Kevin! Thank you for chasing this down. I suspect this is just one small example of the unintended consequences of the new EU GDPR rules. Any chance you could make this skill download available from amazon.co.uk? Checking in from Canada .... any way to make this skill workable in Canada. Even using an amazon.com account, I can't enter my API key for a PWS located in Canada. I have sent two emails to WU regarding this Station ID/API change and requested them to at least reverse the change for US users if not everyone. In the meantime, how can I continue to use My Personal Weather skill in Alexa? It still requires and API when I try to set it up.